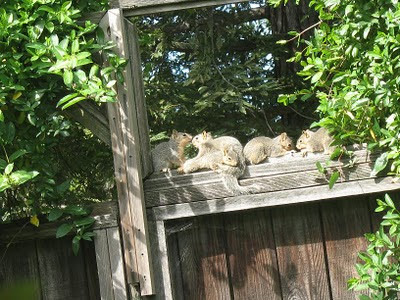 We have a park behind our house, so there are squirrels hanging out on our fence regularly. I was fascinated by this one - it was napping in the sun - and it stayed that way for a long time! I didn't get the shot in time, but the eyes were even closed! 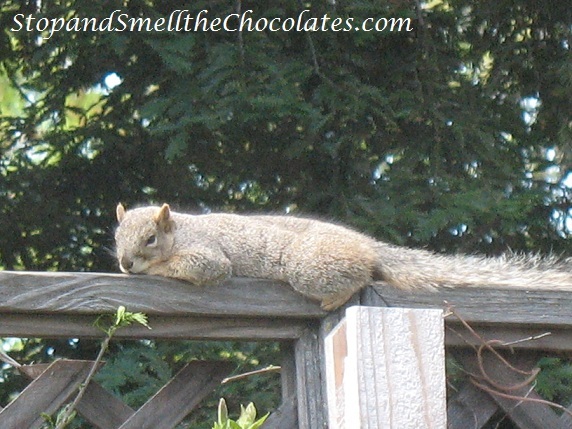 When do you ever see a squirrel who isn't running around or completely twitchy? So yeah, I'm never wordless for Wordless Wednesday - LOL! Go check out other fun WW pics at 5 Minutes For Mom! Oh man I remember that picture from a couple years ago. I'd never seen such a group of them all together. We used to have one that would stretch out on top of our post out on the deck and do that. It's kinda cute. Big wordless Wednesday is more of a guideline that obviously shouldn't be followed by anyone who has chocolate in their blog name size hugs to you. That second picture is crazy! I've never seen so many at once! I have trouble keeping quiet on WW too! Hi Lisa! I found your blog through the UBP linky. Love your blog. Nice to meet you. I'm fairly new at blogging so if you ever go to my neck of the woods, you can follow me at http://writingandallthatjazz.blogspot.com/ I look forward to reading more!